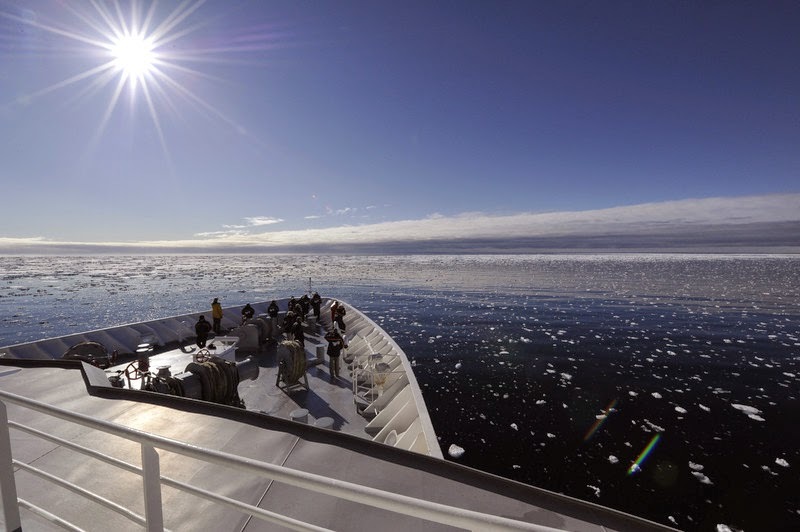 The HANSEATIC, one of the two expedition ships of Hapag-Lloyd Cruises, has become the first non-Russian cruise ship to navigate the Northeast Passage successfully. After a total of 6,032 nautical miles, the ship, which has the highest ice class for passenger ships, sailed into port at Bodö/Norway yesterday morning (Wednesday, September 10, 2014). The Northeast Passage is the legendary sea route in the Arctic Ocean, which runs along the north coasts of Asia and Europe, from the Bering Strait to the White Sea. On 13 August 2014, the HANSEATIC set out from Nome/Alaska on its expedition – which included stops and stations at anchor off the Chukchi Peninsula and Wrangel Island – through the Kara Sea to Novaya Zemlya, the Barents Sea and Murmansk, which marks the end of the Northeast Passage. The cruise was fully booked, with almost 300 people on board. The 18-metre-wide ship was loaded with 70 tonnes of provisions for the guests and crew. The crew organised 22 landings and tours with the 14 on-board Zodiacs, rubber boats, which are well suited to expeditions. There were spectacular animal sightings from on board the HANSEATIC, with guests spotting polar bears and walruses. Furthermore, the ship set a new record for passenger ships: during this expedition cruise the HANSEATIC reached the northernmost point at 85°, 40.7' north and 135°, 39.6' east. At this latitude, the HANSEATIC was just 480 kilometres from the North Pole.